I am a very new collector and am wondering if, and how, other collectors number their specimens. Is there a preferred type of label to affix or is it better not to try to attach anything directly the the mineral. That's okay, Jordi. Those links point to very interesting topics about labelling I think everybody should read. But what about specimen numbering, which is actually the title of this thread? Should the numbering be sequential, i.e. following a chronological order? Or are there other valid criteria to do so? I couldn't find any reference to this topic in the whole English forum after using the search utility. >I am a very new collector and am wondering if, and how, other collectors number their specimens. I don't believe there is any standard for numbering a specimen, if by that you mean assigning a catalog number. I know when I designed my mineral catalog software, I inquired about what systems were in use, and could find no consensus. So, for the GneissWare, I left it entirely up to the user, and let the user enter any combination of letters and numbers. Because I internally assign a unique ID for each specimen, this allows the user to change his/her mind if they stumble across a cataloging scheme they like better. This worked well, because I changed my mind about catalog numbers at some point. I used to assign a catalog number of the form RG1999-001 which meant it was from my collection "RG", was obtained in 1999, and was the first specimen. This got unwieldy really quickly. I had a number of specimens which already had a number from the previous owner, so this would have meant renumber these specimens. And, for some specimens, I had gotten them so long ago, I couldn't remember the exact year. At some point I had a request from a museum for a report filter in my mineral catalog software where a portion of the catalog number could be entered. They would assign in their catalog a number consisting of the donor's initials followed by either the number pasted on the specimen or they would assign a unique number if no number was present. I decided for my collection to follow this form. So, for a specimen formerly in the Arizona-Sonora Desert Museum, which had a number 1090 pasted on it, my catalog entry is ASDM1090. If the specimen is from a dealer with no number pasted on it, its number history starts with me, thus, for example, RG1044 (meaning the 1044th sequential number for my specimens, not the 1044th specimen in the collection because of the other collector's numbers). As to the question about pasting a sticker or label with the catalog number onto the specimen (or using paint and india ink), I opted not to do so. II enter all the information into GneissWare, including a description and a picture, and track which box or drawer the specimen is located, so I don't think that a number pasted on the specimen is necessary. I do leave old numbers and stickers on specimens, because they are part of the history of the specimen. I believe that specimens should be numbered. Especially so if you want to maintain a catalogue of your specimens. Attaching a number matches the specimen to your catalogue notes. and of course aids someone in matching the specimens in the case of your ulitimate demise. one system for my miniatures/thumbnails and one for cabinet size and above. This way of numbering fairly well ensures that I will never run out of unique numbers yet keep the number size the same - I have never acquired more than 999 in a month and even if I did - I could simply go into the 1000s !!! This number is affixed with a water soluble glue so that if another collector/s wanted to remove it they could. In the infrequent times that I have subsequently cleaned my specimens and the number were to come off (haven't yet - cos I'm careful) - I would simply reprint and reattach. Size of sumber: My numbers on the cabinet specimens are sized so that the whole number covers an area approximately 1 cm square. The numbers on the thumbnail specimens and miniatures is approximately 3mm x 7mm. Printed on paper via Excel and affixed with a water soluble glue. When I was younger I used to write my number in Inida ink using a fine nibbed pen - but the eyesight isn't what it used to be so the computer was the way for me. A matching number is affixed to the underside of the display label and of course is referenced and printed on the catalogue sheet. A paper catalogue and electronic catalogue being maintained. The paper version enables me to keep track of former labels and "other stuff" that may be associated with the specimen. Gee whiz Bob. You have to take the long view, look out there a hundred years (or more). I have a number of specimens in my collection with numbers on them. They are meaningless. Oh sure, the one or two with HO on them are from Herb Obodda, and I have a couple of LP numbers (on grey acrylic paint), so those are from Les Presmyk. But so many times you buy or trade for a specimen, say an old specimen, and there's a number on there. So you open up a dialogue on FMF, ask for input from the folks out there, and maybe you get lucky, someone recognizes it and you can track it down. But let's face it. Specimens become separated from their labels. Maybe years, decades, who knows how long after you've passed on to that great crystal-filled vug in the sky (or wherever, depending on your religious convictions), some poor soul will be left holding a beautiful specimen and wondering "Gee, I wonder where this came from?". Best to put at the least the locality on the specimen. If there's enough room on the backside, then a complete label with everything. If not, then at least the locality. There's always someone out there who will be able to ID the specimen. But the locality, that can be troublesome. 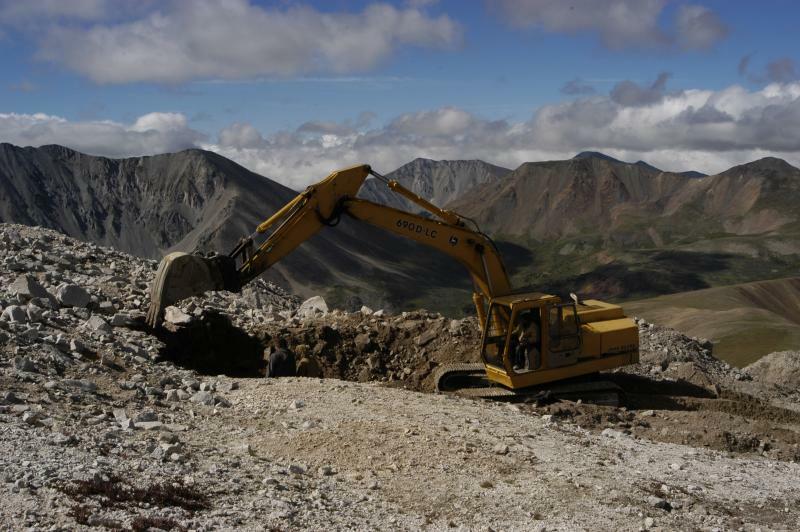 And in the future, when so many mines have closed down, China has mechanized and the flood of specimens from there has dried up, who will be able to tell with certainty just exactly where the particular specimen originated. Of course it's good to have computer programs with photos and all of the pertinent data for the piece, prices and so forth. I track this stuff myself, because it is all meaningful. But later on, when the rock has become separated from the dataset, then the information affixed to the specimen itself becomes so very important. Now this is just my view. We all recognize that ultimately, we are just stewards of the specimens that pass through our hands. They will long outlive us. I simply want to be the best steward that I can, for my sake, for my sake of my heirs, and for whoever winds up treasuring the piece somewhere down the road. 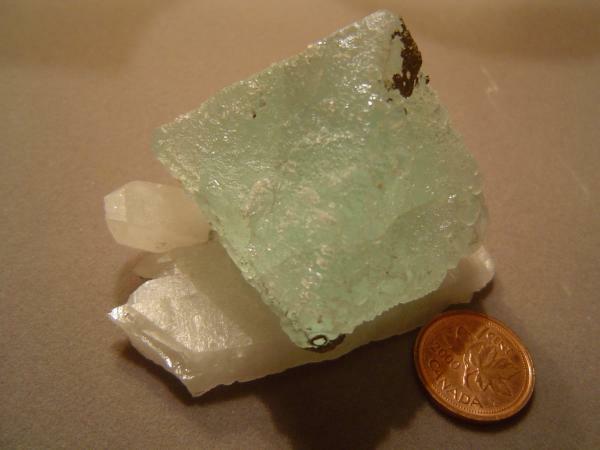 As an example, I submit two photos of a fluorite from Kazakhstan. The specimen is an octahedron, about 40 mm along the edge. There was a number on the backside, a sort of S/5 030. Who knows what that means, but it doesn't matter. I've put down the locality that the dealer provided to me, and I trust him, so it stays with the specimen. All of the other stuff, like the price asked and the price I paid (sometimes these numbers are different, not so much anymore, but sometimes), all of those things, are written on the back of the dealer's original label, which also has the acquisition number and a description. I used to take slides of my specimens and write up all sorts of notes on index cards, but that became just too much work. This is simpler for me, and I figure I'll do something more elaborate (and electronic) when I'm old and retired. If that ever happens. Just my thoughts, it's how I curate my stuff, and I'm passing it along to the mineral community. As far as attaching a number to each specimen, which is what I do, I use a water soluble white glue which dries clear and then I coat it with clear fingernail polish. My numbers are typed on the computer, copied twice, and each set is then sized differently so that I end up with three different sizes of numbers. This is done because I have many very small and intermediate specimens. If the specimen is too small to accept a number then I put it in a small glass-top box and attach the number to the box. All of these numbers are worthless, of course, unless there is a catalog and I trust that we all are very carefully cataloging our collections. I well remember the famous American collector Neal Yedlin who used to print all of the locality information on a label, shrink it to fit the specimen, then glue it on the back of the piece. The label also contained his initials NY. In my youth, I remember a story about a large European collection that was moved right after World War II. The specimens were supposedly in one boxcar and the labels and documentation were in boxes in another boxcar, with no numbers on the specimens. If there is no connection between the catalog and the specimen, they have a way of getting separated. I bought a large collection a number of years ago and while a lot of the specimens were labelled, I realized that the collector had numbered all of the specimens and had probably kept meticulous records of each specimen, and especially those he field collected. Unfortunately, his widow or his daughter threw out all of his papers before I bought the collection. All specimens should at least have a number on them. I like John White's method although I use clear fingernail polish under the number as well as on top. I always enjoyed getting one of Neal Yedlin's specimens because all of the information was with the specimen. Someday I will do so with our collection. If you have not yet experienced it, just wait until you acquire a specimen based on an old label, only to discover somewhere along the line, the wrong label got placed with a different specimen. I have had that happen twice in the past year and both times the way I discovered the problem was because the number affixed to the back of the specimen did not match the number on the specimen. As Ed mentioned my older specimens have a gray paint patch with hand numbering. I have found going to an art store and getting archival quality paper, printing out numbers by whatever system makes sense to the collector, and affixing them to the back of the specimen with water soluable glue and cover them with either clear fingernail polish or shellac works great. We number each specimen and keep a record of each and every one. We back up the files, print them out on occasion also. When we donate a mineral to a child we note, right away, in our system that we have done so. Our numbers also have a lone star on them, since if you live in Texas you are supposed to let everyone know it...as least that is what we assumed when moving here from the "Yankee" land up north. So it is a distinctive numbering system. So, a lone star and a number are on all our pieces and they match the catalogue system we have in place too. Man, that is great Gail. A Lone Star and an acquisition number. How distinctive!! Some day we'll each have something that the other wants, and we'll trade, and then I'll have a Spann Specimen that I can display with pride. ("See that star right there? Proof positive that it is from the Spanns.") I look forward to seeing one, perhaps at set-up or tear down in Tucson next year. I didn't know that Neil Yedlin glued a complete label on the back of each of his specimen (or on the box, wherever). I've always followed his advice though: "Buy and use a good mineral book". Turns out I was doing as he did, as well, vis-a-vis the label on the specimen. Thanks everyone, for the input. This has been an enlightening dialogue. Being from Arizona, it is tougher to put a picture of the Grand Canyon on each specimen. That is why I opted for LPP for Les and Paula Presmyk although in the early days it was just LP before she graciously consented to become my wife. Yes, Mr. Yedlin even did so on thumbnail size pieces. What type of printer and ink are you using to generate the labels that get affixed to the specimens? I would think archival (acid-free) paper is a must. Ink jet ink and laser toner both have some issues, I would think. Ink-jet ink may be water soluble, creating a problem with water-based glues. Laser toner will probably smear in the presence of nail polish if used for coating the label. I am not sure about the paper for doing locales but it will have to be fairly light. I have noticed the issue with various printer inks dissolving with fingernail polish, especially if you have to go over it a second time. I give my sheets of numbers a quick spray of clear lacquer or varnish. I have not had any problem with the numbers smearing as the result of the fingernail polish soaking up through the paper. Nor, would I expect any problem with water soluable glues soaking through. Tony, Aren't you going to post a copy for all to see?!? Tony, please don't !!!! ha ha! It is a one-of-a-kind, original piece of inspired artwork that I would arrange private showings. Tony was correct in that it took me a couple of minutes to stop laughing when I remembered the image. But, we digress from the serious subject of mineral numbering. Thanks for the interesting and enlightening discussion. I have so far kept my specimens with separate labels and no permanent numbering system or specimen database. As a part of a major re-organizing of the quite extensive collection built over more than 40 years, I plan to reduce the number of specimens and make a permanent numbering system and a database for what will be retained as the core of the collection. This will include both a general systematic collection and different locality suites and display specimens. After reading all your posts I am inclined to make a very small label affixed to each specimen with water-soluble glue. 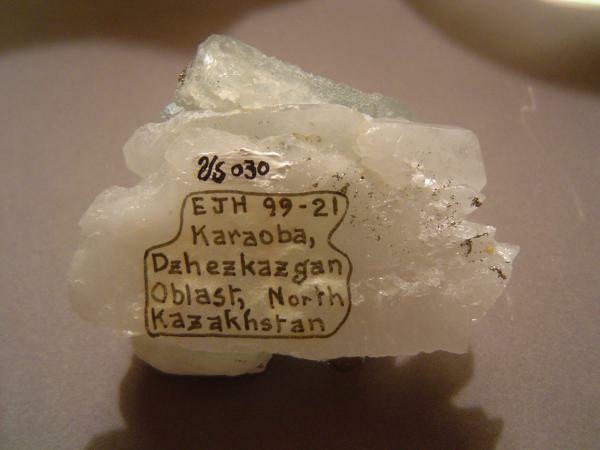 The label will contain a serial number (year of acquisition + 3 or 4 digits) + the name of the most important mineral on the specimen and the name of the locality at the lowest and most specific level + the international country prefix as used in the postal system. All other information will be on the separate label and in the computer database. Boxed specimens will have the information on a label on the part of the box where the specimen is mounted. I have tested such a system where the size of the labels to be glued to the specimen can be 20 x 10 mm or copyed down to 10 x 5 mm if necessary. If the specimen should be separated from the larger and separate label and the collection database, I believe tracking a locality by this basic information should be fully possible using locality databases like the one in Mindat. I will now explore what kind of paper, printing and glue to use before embarking on the project. Thanks again for starting this discussion which has been of great help in making the final decissions. Once you determine what type of paper you are going to use for the labels on the backs of specimens, I hope you will share what you learn. Everyone has their own priorities and preferences and a cataloguing system is going to reflect those choices. For me, a simple sequential set of numbers with our initials suffice. The database will hold all of the information such as date of acquisition, price paid, etc. Then when I retire I will start the process of affixing the locality information to each specimen as well. 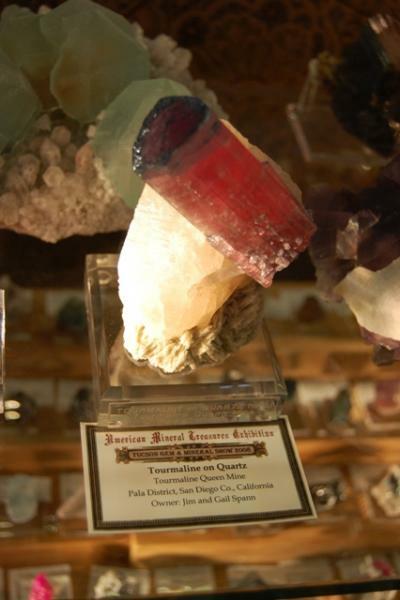 Unless it is a rare species, I will not include the mineral names, just for the sake of saving space. For what its worth here is my two cents. I have adopted the Dana numbering system with a sufix number. My first Quartz would be 75.1.3.1 (01), Gold, 1.1.1.1 (01), etc., and use these in my catalog. I also have sveral photos of each mineral for reference under that catalog number. I do not have any lables directly on my specimens. I have vacillated for and against that for many years. Oh well.